September sun, when it actually emerges, gives the best light! These photos were taken by my daughter this morning, no adjustments needed as the colours are singing and dancing. I made this Camber dress (by Merchant & Mills) at the start of the month with some Nani Iro double gauze in a gorgeous blue from Eternal Maker that has been waiting for its destiny for over a year! 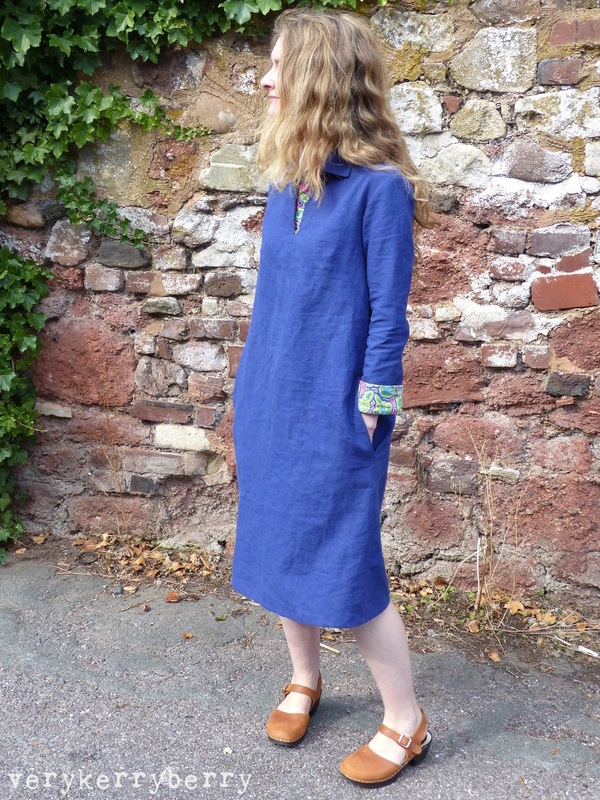 I didn't have sufficient for a standard layout with the pattern piece grainlines following the selvedges so I had to go rogue; the back below the bodice was placed perpendicular to the selvedge with no ill effects and I used all of the 1.5m length, only tiny scraps remained. Lengthened the bust dart to be the equivalent of size 6 and altered the sides accordingly so the point meets the size 8 dart markings at the side seam. Reduced the front and back bodice pieces and back yoke at the centre fold mark by 1/2" on each piece- the width was too wide for me and my apex to apex measurement is narrow at 7". I adjusted the neckline so it remained the same, so the shoulder seam width is reduced a little at the neckline front and back. This is a significant reduction of 2" around the garment so creates a more fitted look than the original style. I reduced the A-line side seams from hip to hem so they were a straight diagonal rather than curving outward. The neckline and back yoke construction is particularly neat. Bias binding finishes the front neckline and a clever bit of seam work over the shoulders means everything is covered and stabilised by the back bodice. 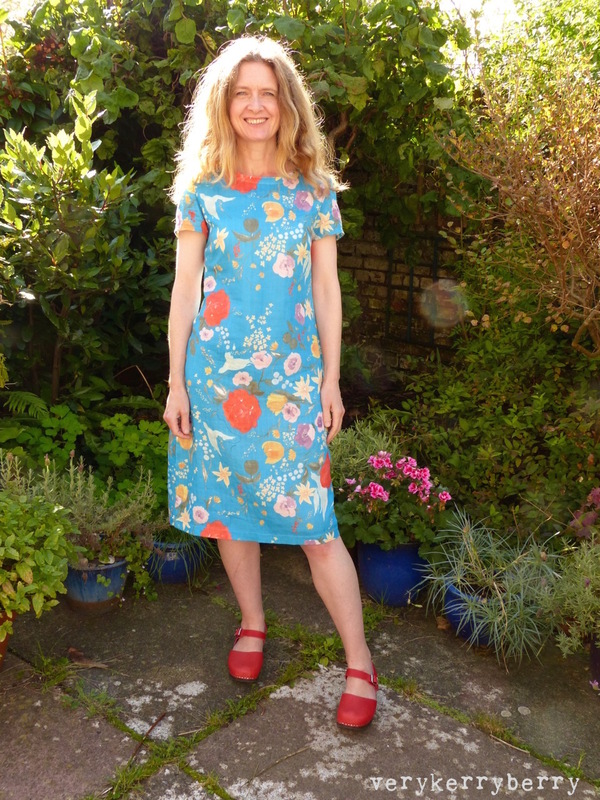 The neckline is quite high but that's fine by me and it would be easy to lower, just allow a longer piece of bias binding, I used a scrap of Liberty lawn. 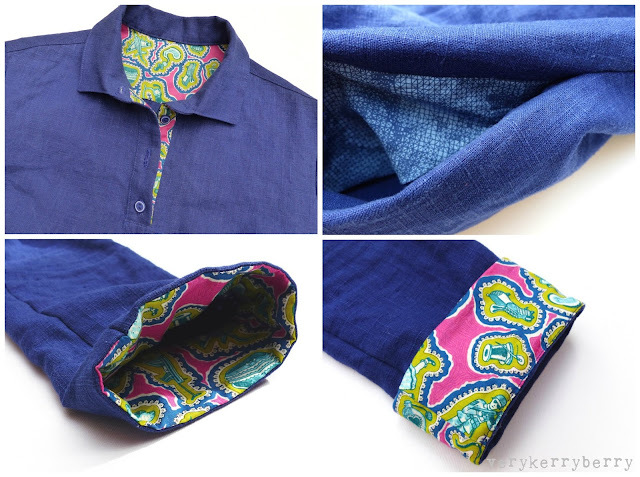 It's a great pattern to showcase a beautiful print with minimal interruptions. The dress is fitted enough to feel flattering and loose enough for comfort. The photos below show the moment where Lottie, our dog, joined in on the photo shoot, hence the facial expressions! 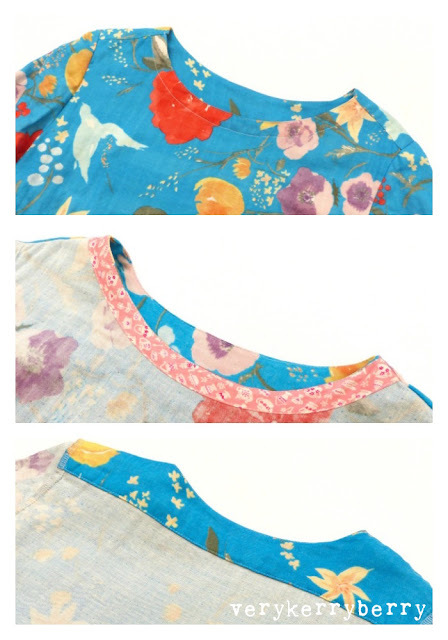 I found the same Nani Iro double gauze Fuccra: Rakuen print here with more options here and in the UK, here. Soft Sole clogs are from Lotta from Stockholm, these sometimes come up as seconds too. 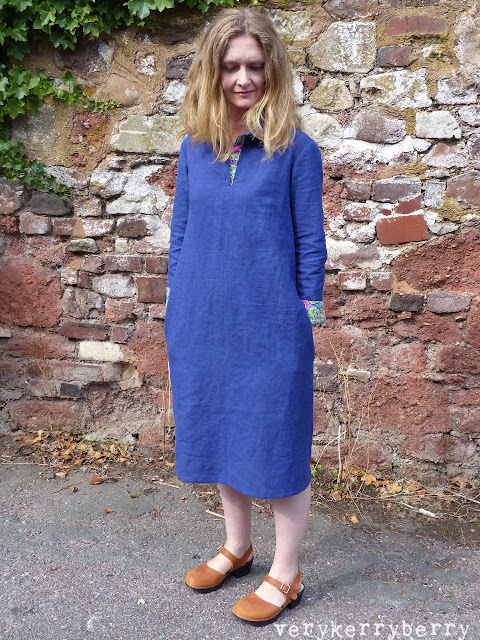 Camber Set - top and dress pattern is available at The Draper's Daughter and Village Haberdashery. 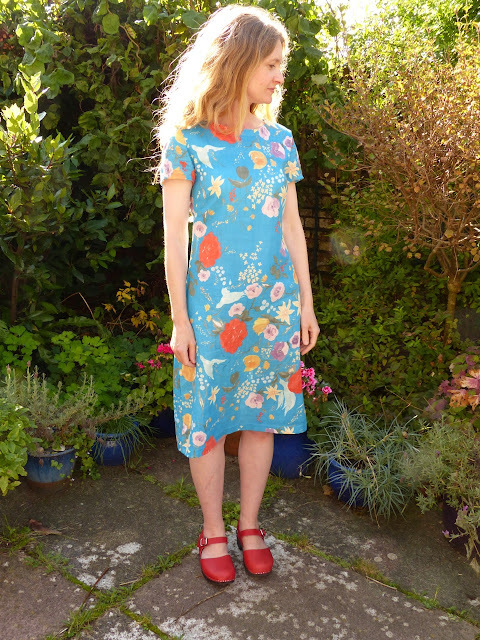 I'm really happy with the finished dress and it's a great basis for tops too - it's going to be a much used pattern! Dashwood, Jardin Anglais, 8 fabrics from Pippa Shaw featuring British garden prints with a French twist. Andover Sun Prints 2018. A new Sun Print range from Alison Glass (this is Diatom in Seaside) all the rainbow colours so this is just one of many, but what a glorious colour! Studio E Super Heroes - TVs Cream by Sarah Frederking. I do like a novelty print and this caught my eye. It has a slightly 80s retro feel, echoes of Playmobil and Bob the Builder. Lovely for children's projects. 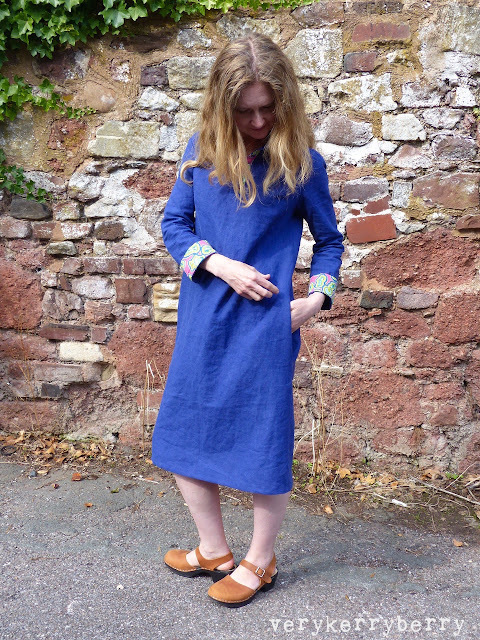 Annie's offer this week (ends 19th Sept) is a free Denim Swatch bundle with denim purchase over 1 metres. Dear Stella, Luna Luna. The sweetest nighttime print on cotton shirting! Beautiful for bedroom makes. A storytime book pocket pillow for bedtime stories maybe? Art Gallery Boho Fusion Knit. 95% cotton 5% spandex jersey blend, rich colours and Art Gallery Jersey has excellent recovery/spring back and works well for tops, leggings, dressings etc. This would make a lovely Agnes top or three-quarter sleeve Moneta dress. Michael Miller, Good Postures in Celestial (also in grey 'Spa'). I love my Yoga so I couldn't resist this fun print. Floral Retrospective in Ice. My favourite of all Anna Maria Horner's Garden Party rose prints. See the other Floral Retrospective prints here, a glorious range of prints in all colours and sizes. Cosmo Tex Charcoal pink floral, linen/cotton blend, Japanese fabric. I love the soft faded look of this fabric, it's on trend with the large florals on dark backgrounds that you can see on women's wear fashions this Autumn/Winter and would work for decor projects like cushions as well as clothing- maybe Jennifer Lauren Handmade Ivy Pinafore? 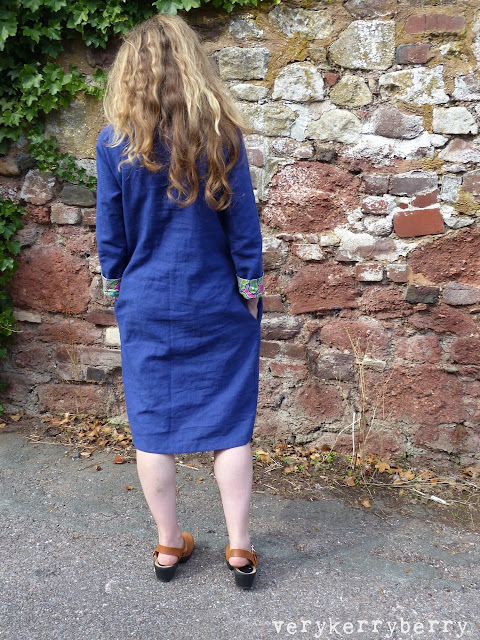 Or even the new Named Clothing Amber pinafore style dress, don't forget a buckle for the back! Sewhouse Seven Burnside Bib PDF. 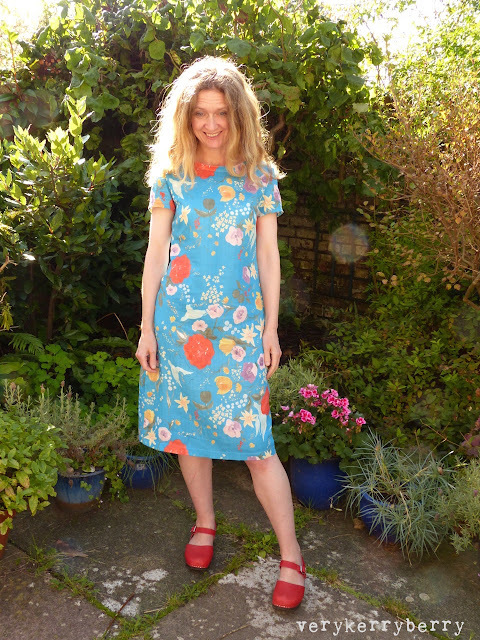 I've made this pattern if you'd like a review and to see it sewn up. Mine have seen plenty of wear over the summer and I'll continue to wear them with boots into Autumn. As the waist is pulled in with ties, the fit is forgiving. Robert Kaufman Manchester Onyx in Metalic. The perfect combination of sparkle and drape, I would love to make the Burnside Bibs out of this fabric for a more evening look dungaree. Both styles have quite a lot of fullness around the back booty so a drapey fabric wins over a standard denim with this style. Each summer I seem to find a dress that I make multiple times. Last year is was Named Clothing's Kielo dress, I made three- see here, here and here. This year, the weather was cooler and so I ended up choosing a cross-seasonal choice, the Merchant and Mills Ruby Dress. This came about by chance. Merchant and Mills started a small ready-to-wear line, Label, and the Rugby Dress was heavily discounted in their sale. 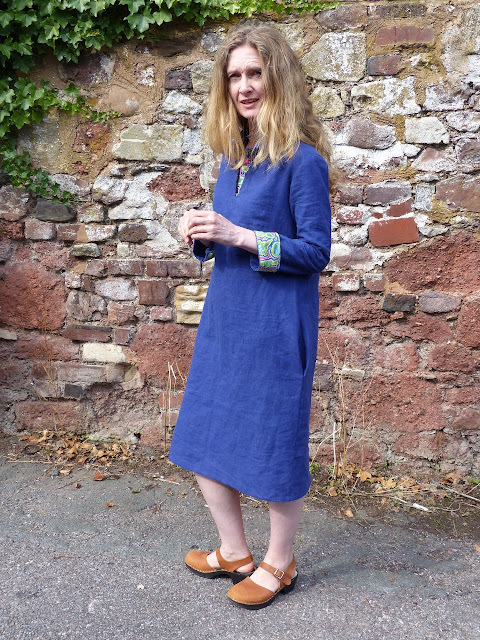 I bought a size 8 and I loved it and wore it a lot and so promptly bought the pattern from Village Haberdashery with some glorious Lady McCelroy linen in Marinee and sewed up this version. Lengthening the bust dart to size 6 point"
Narrowing the side seam from underarms to pockets by 1/4"
I find Merchant & Mills patterns seem to differ from each other little in their presentation and instruction style. The Rugby dress has size 6 cutting lines, the other styles (I have the Factory Dress, and the Camber) do not. The Rugby has smoothly drawn digital style diagrams, the others have hand drawn sketchy pictures. There was a minor error and there are amended extra instructions to cover this (it's to do with the order of sewing in the collar). Check each pattern for seam allowances as they can vary too. Merchant & Mills designs look simple but there's always a very neat technique or finishing method and the pattern drafting is beautiful, even though I always make alterations, they are simple. Every pattern I've made involved narrowing the centre in some way: either lengthening the bust darts and shaving down the side seams, or reducing the centre width at the centre fold line (did this on the Camber, more to come on that when I get photos!). 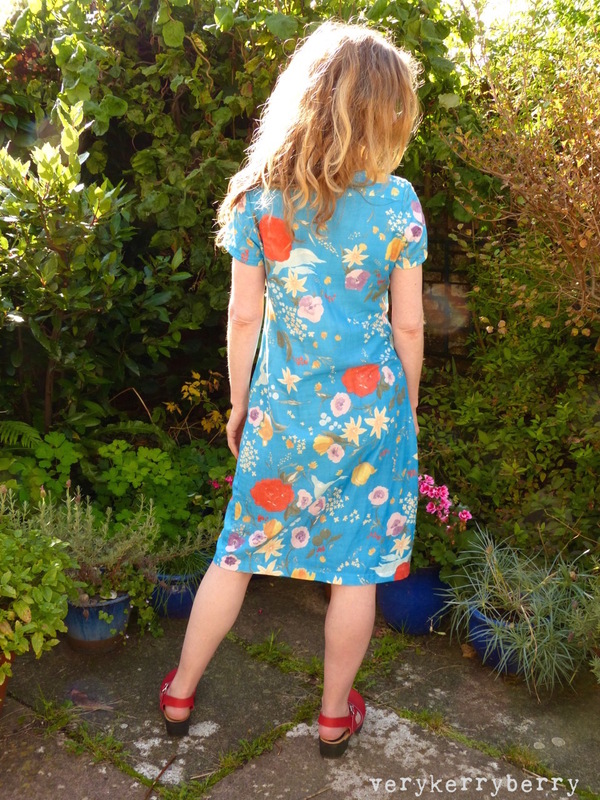 I especially like the closer fit on the shoulders combined with lots of room to move in the skirt section, plus the pockets are placed perfectly for me and disappear into the side seams. I faced mine with Liberty lawn in a blue cross stitch print. 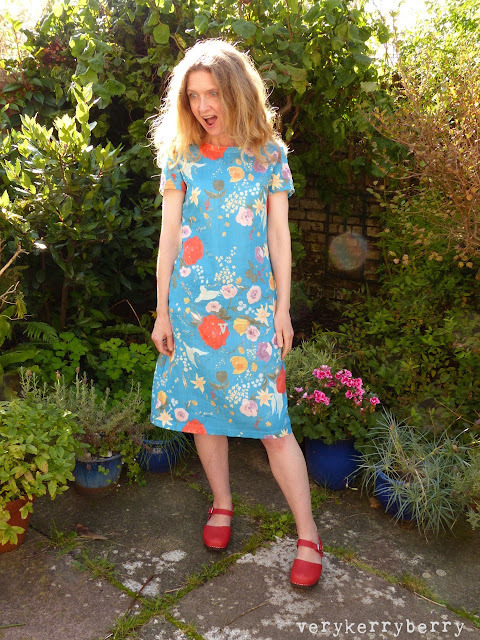 The visible Liberty lawn on the collar, placket and cuffs is a Grayson Perry print (long out-of-print) that I have scraps of from a dress from years back. It is one of my all-time favourite fabrics. The Lady McCelroy linen is a lovely weight for this style, it definitely needs a prewash and colour catcher too! 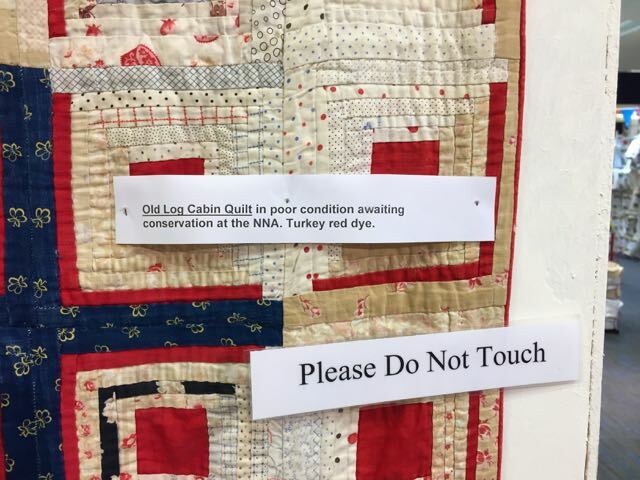 I haven't been to a quilt show in a while. 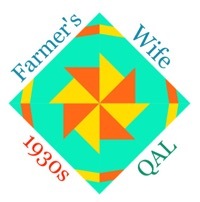 Festival of Quilts always falls in the busiest bit of my summer work schedule, plus travel is costly for a day's experience. 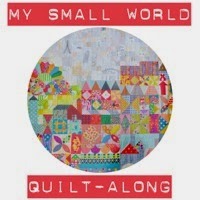 There are a few stitchy/quilt shows in my local area. 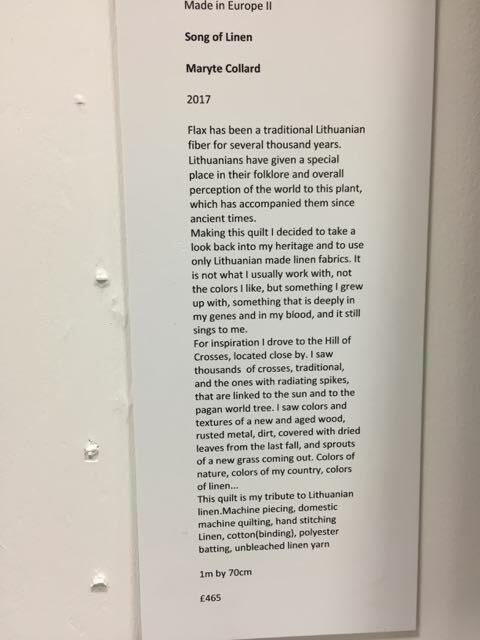 The annual spring quilt show has declined during the years- it's part of the Grosvenor show group and my experiences there have been patchy. Many smaller stall holders have found themselves priced out over the years- the cost of the show plus accommodation can negate the money made. 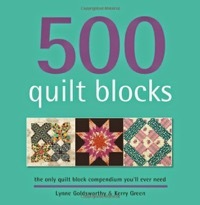 The curation can be questionable at times- stalls with no quilting relevance e.g. commercially produced scarves - don't make a good quilting show. 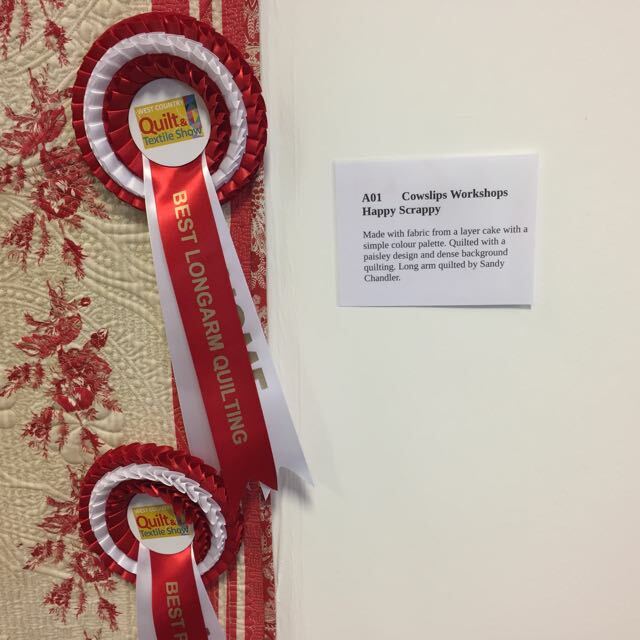 West Country Quilt & Textile show is a relative newbie and it's the biggest plus is that it appears to be independent. When I booked my ticket and a workshop online, there was genuine hobbyist enthusiasm from one of the organisers. 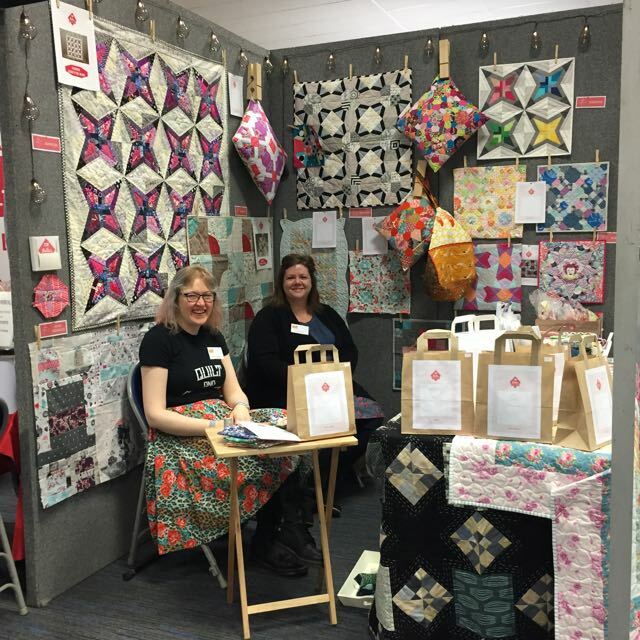 Reene of Nellies Niceties had a lovely stall showcasing her English Paper Piecing kits. I loved her samples in so many colourways and the giant clothes pegs displaying her cushions. I've not seen Jessie of Sew and Quilt since a Fat Quarterly Retreat years back so it was lovely to catch up with her again and meet her husband Robin. They had a delectable range of fabrics and notions. 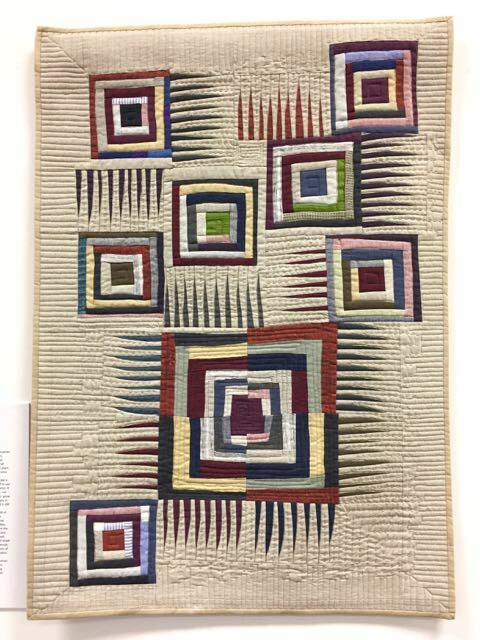 There were lots of small interesting displays including a few exhibits from the National Needlework Archive which I hadn't heard of before and to be honest, their website seems to have no reference to quilts but this log cabin quilt is a beauty! 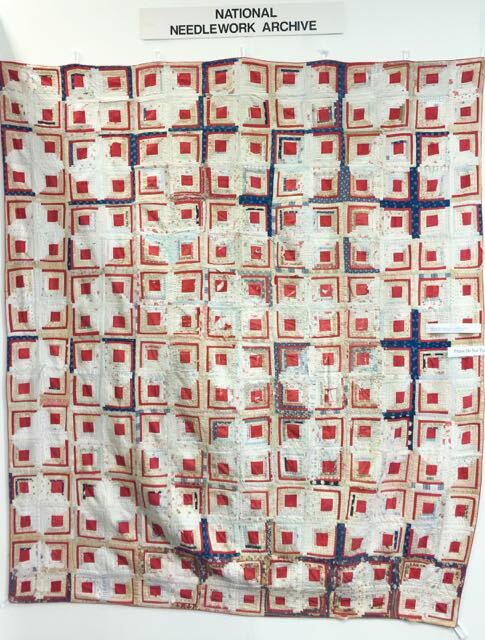 There were competition quilts and one of the winners was Jo Colwills Happy Scrappy quilt, longarm quilted by Sandy Chandler. 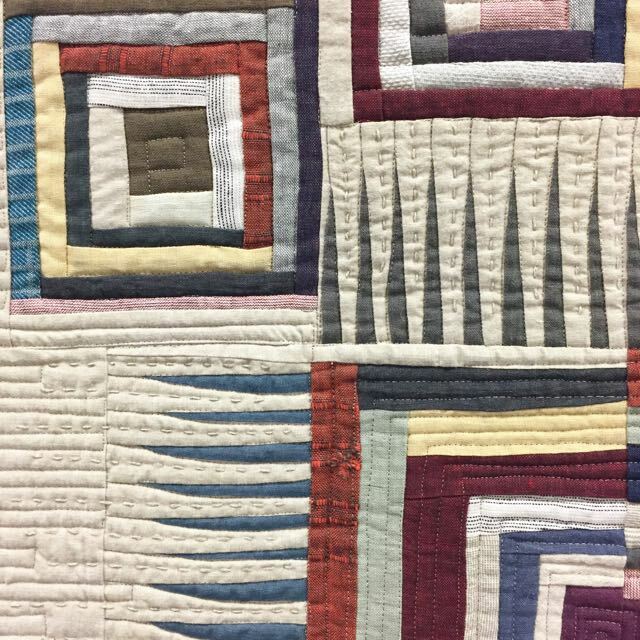 One of the booths has some stunning whole cloth quilt hand-quilting, sewn by Sandie Lush. I had a brief chat with Sandie as she was stitching. I asked her how she transferred the designs as they are small scale and intricate and she passed on the most wonderful tip! She uses a watercolour pencil which tones with the thread she is using. 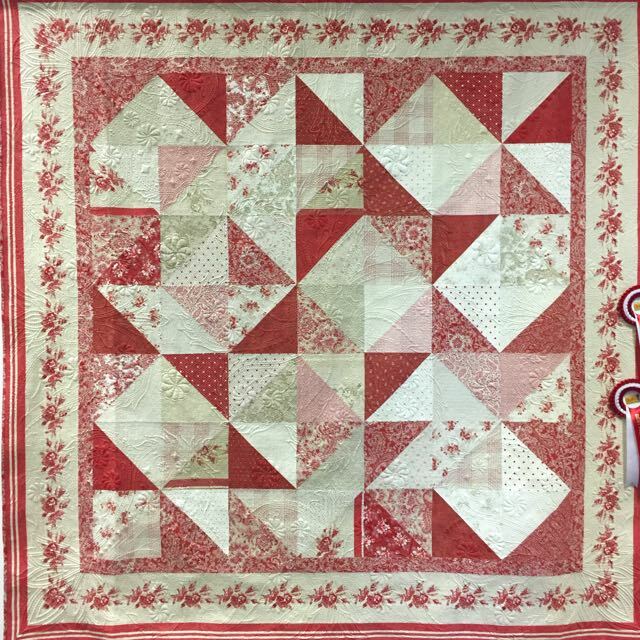 She was sewing with a pink 12wt Aurifil thread at the time and had used a maroon pencil to trace the design from paper to fabric (before the quilt sandwich stage). 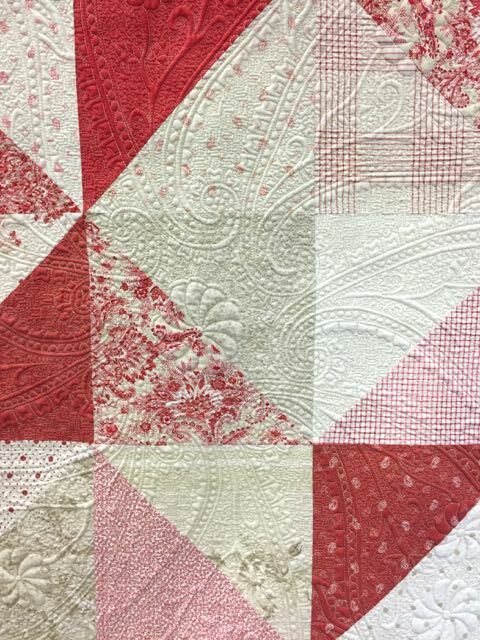 The watercolour pencil brushes off as she sews and it can also be rinsed away at the end of the quilting, brilliant! I'm not really in need of lots of fabric so I made a list of some harder to get items that I have wanted for a while. 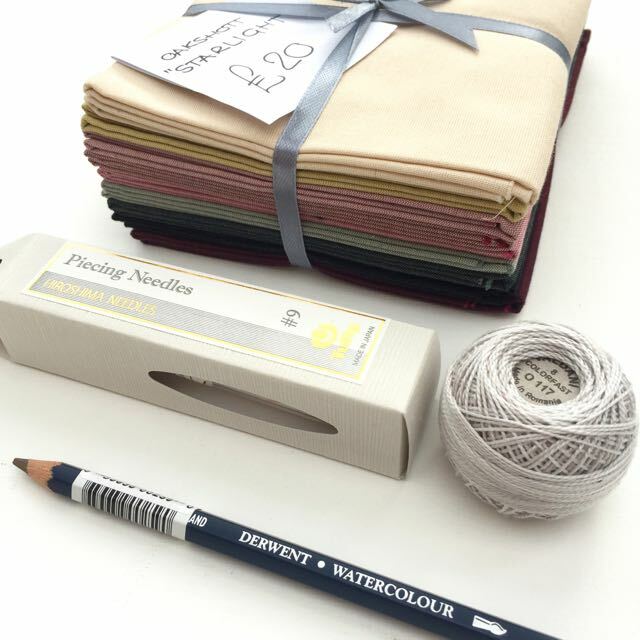 There was a tiny Oakshott stall selling 'Starlight' bundles (based on an older colour selection) only £20 for 10 FQS. The Tulip Piecing Needles #9 from Sew and Quilt are a favourite, my go-to for binding and there are only a few in a package so I needed to replenish. 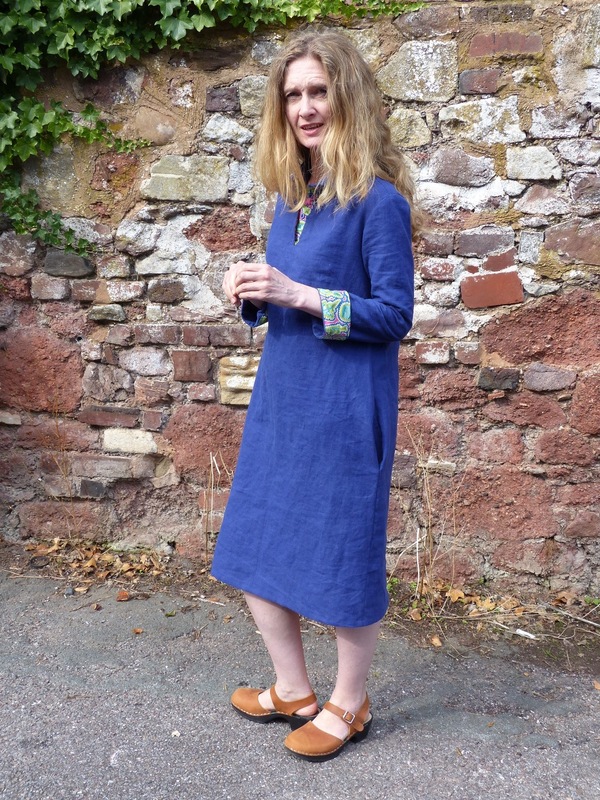 The Valdani thread is fiendishly difficult to buy in the UK but I knew that Angela Daymond is one of the only UK retailers and she was attending the show with her stall. 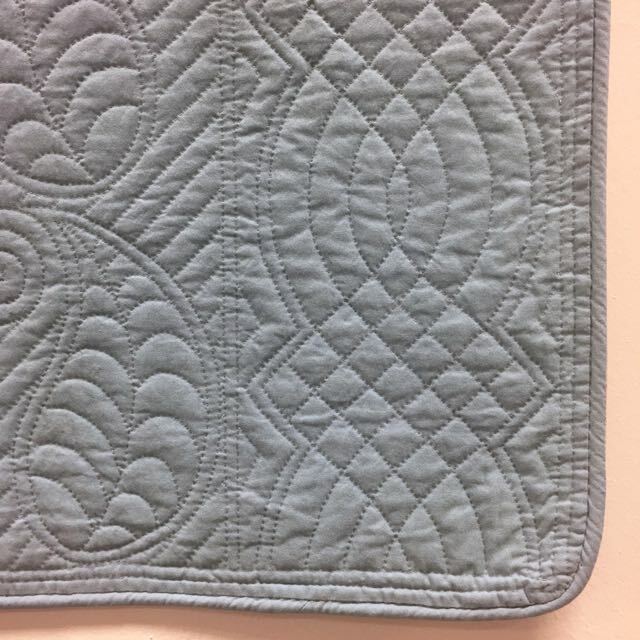 It has a lovely twist to it, perfect for big stitch detail on quilted projects. The Derwent watercolour pencil was from Sandie Lush. It was gently busy rather than bustling. 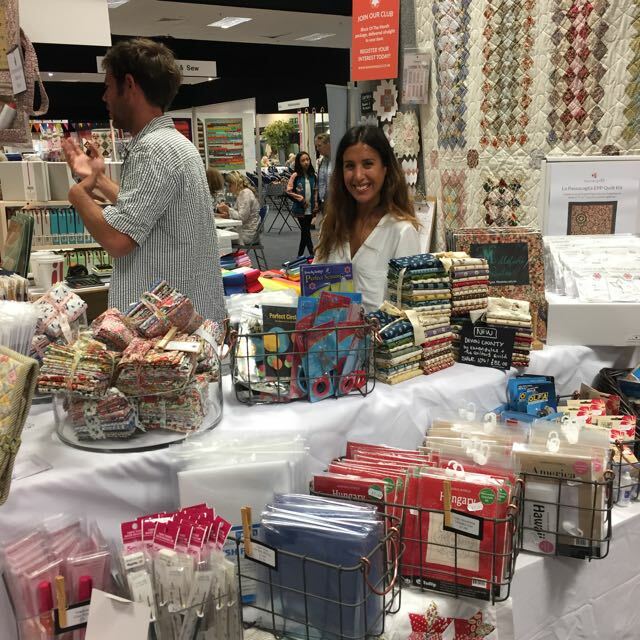 The majority of stalls were for quilting and textile crafts with a few textile related exhibitions e.g. selling silk ribbons or leather for crafts. I attended a Royal School of Needlework workshop which was excellent and a bargain at £12.50 for 1 1/2 hours with materials provided. 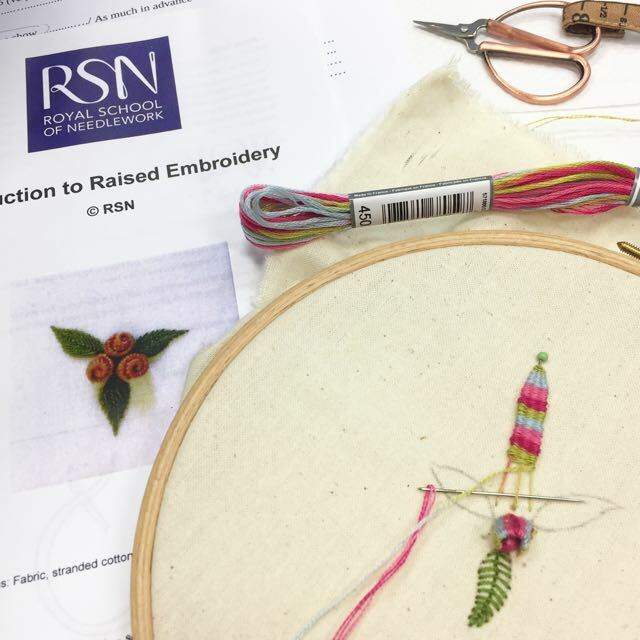 There were around 10 of us and we were in a quiet room with a friendly and capable teacher, Chrissie Juno Mann and we learnt a clever stumpwork weaving and rolling technique to produce a 3D rose. All in all, I enjoyed myself. I was there from 10-2pm and had to leave then to catch a train home. I'll definitely be back!